Proof content strategy works. Here’s what it did for me. Is your content strategy the only thing that got your results? Signing off and toasting: To executing your strategy and plan to deliver results! 60% of the most effective B2C marketers have a documented content strategy. Does it live up to the hype? Does content strategy actually deliver results? Putting time and effort into strategizing, planning, and then executing a content strategy and plan is a big investment. 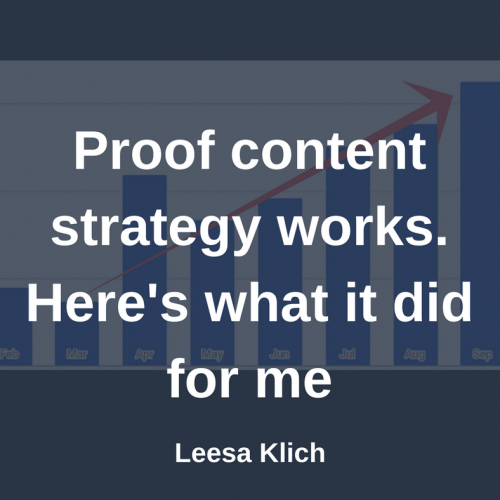 I’m proud to say that I am living proof content strategy works. When you have a clear and structured content strategy, and a solid plan (a.k.a. editorial calendar) you don’t have to stress over what to create each week. You’ll already have a plan in place for what to create when. And it will be strategically planned to support your niche, product/service launches, and overall business. Plus, you can feel good knowing that your content will help set you apart from others online and grow your audience at the same time. Implementing a content strategy has been proven to increase traffic to your website, which results in more leads and more sales for your business. It’s totally working for me. I literally crunched the numbers this week. I went into my WordPress Jetpack Site Stats to view my traffic by month. The graph didn’t show any crazy massive jumps in traffic all of a sudden. I surely didn’t notice anything in particular. My traffic didn’t double in one week, nor did any of my posts go “viral.” Plus, those are rare and very unlikely. What I actually saw was a nice and constant increase month-to-month. So, I went back to my content strategy editorial calendar to see when I started planning and strategizing (and executing) my blog content plan. For my blog, that started in April before Earth day and #marchforscience. As you can see from my editorial calendar, I started blogging every single week (except one – more on that below). And, because I decided to invest in really ramping up my blog to grow my health writing business, I was aiming to create not just any old posts, but epic ones. Or, at least, long-form, high-quality niche-specific posts as much as possible. Some weeks really were epic. So, after seeing the dates and the numbers, I looked at the difference in traffic between March (right before I started using my content strategy & editorial calendar) and September (last month). Coincidentally, that happened to be exactly 6 months later. The numbers freaking blew me away! My traffic had increased 4.43x over those 6 months! Yes, more than 4x more pages were viewed on leesaklich.com in September 2017 than in March 2017. All of this had happened, slowly but surely, by executing a well thought out plan week after week. What about my email subscriber list, you might ask? That increased by 39.5%. So I gained more than 1/3 more subscribers in those same 6 months. My strategy and plan were my directions, but I also followed-through to travel to where I am now… At least most of the time. There were a few weeks I didn’t pull out all the stops. I couldn’t keep it up 100% every week. I had client work to do, and kids home for PD days or summer break. I had a few long weekends away during the summer. One week (#Canada150) I missed completely because we rented a cottage on a lake. A few other weeks during that time I created a ho-hum kinda post. But I did put a solid effort into most of the posts I published in the past 6 months. I had a strategy and plan. I executed it. Regularly. And I executed it well. This meant high-quality blog posts weekly (except for one week) throughout those 6 months, and some of those were epic blog posts. You can have a look at my blog for yourself. Just about every post is over 1,500 words, some are over 3,000. A couple of them have content upgrades for people to download, sometimes in exchange for their email address. Plus, I’m pretty proud of my post on how to spot fake health news. SIDE NOTE: This is why I started researching and writing long-form high-quality health articles for practitioners. Not only do I love it (and am pretty damn good at it); but, many people don’t love or have time for this grind, and still want (and deserve) great content that showcases their expertise. Win-win! I certainly would NOT have anywhere near the success if I had a strategy and plan and left it on my hard drive to collect virtual dust. And publishing on my blog wasn’t the end of it either. I also guest posted on another blog, and was a guest for a live “ask me anything” video call on another one. So, I also got exposure to a couple of other audiences in the meantime. And, of course, I promoted my blog posts and guest appearances in my newsletter and on social media. (Follow me on Twitter here). But it all started with a strategy and calendar. With all of these in mind, go ahead and create your content strategy. Now, watch me plan 5 weeks of content in under 20 minutes with this spreadsheet. Open up your copy of the sheet, pause the video where necessary, and get yours done too. With consistent high-quality, strategically-planned content on your blog/vlog/podcast you can build a targeted audience, email subscribers, and ultimately, customers and clients. It’s not just hype. I’m proof content strategy works. What do you think? What’s the hardest part of following through on a strategic plan? Do you have a content strategy? Do you have an up-to-date editorial calendar that supports your strategy? Do you want them?